As travelers seek new and different experiences, adventure tourism continues to grow in popularity. Adventure tourism, according to the Adventure Travel Trade Association, is a tourist activity that includes a physical activity, a cultural exchange, or activities in nature. You don’t necessarily have to go base jumping or go scuba diving with sharks to be an adventure tourist (although those activities definitely qualify). Adventure tourism is about connecting with a new culture or a new landscape and being physically active at the same time. It is not about being risky or pushing your boundaries. In fact, it is especially important to know and respect your limits while you are in an unfamiliar area. Our list of adventure tourism activities has plenty of options if you aren’t necessarily a thrill seeker. If you are an adrenaline junkie, don’t worry we still have a few ideas for your next trip. Getting out and experiencing a new location under the power of your own two feet is always a great option. Hiking allows you to slow down and enjoy more aspects of your surroundings. Day hikes are a good option for most anyone that loves the outdoors. If you happen to be in Costa Rica, you can take a guided hike up to the top of Cero Chato, a dormant volcano. You get to hike through the rain forest and your reward for getting to the top is a beautiful lagoon! Be sure to remember to wear moisture wicking clothes; Costa Rica can be quite humid. If you are more adventurous and have the proper equipment, you can extend your day hike into a backpacking trip. Backpacking allows you to stay out in nature longer and see more things than you would on a normal day hike. It is important to have the proper survival knowledge and gear. If you haven’t backpacked before, make sure that you go with someone knowledgeable that will show you the proper backpacking techniques. The Gore Range Trail is a great way to explore the mountains outside Silverthorne, Colorado. The whole trail is 41.7 miles long and is rated as a difficult trail. The scenic views make it worth the effort. If you’re not up for the full hike, you can set a goal for reaching one of the high alpine lakes along the trail. 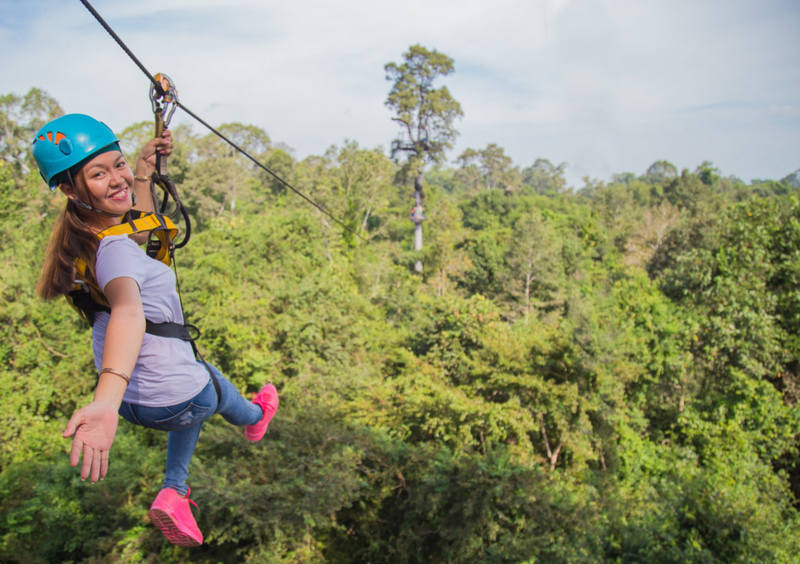 Want to soar through the trees and experience nature from a different angle? You should try zip lining. 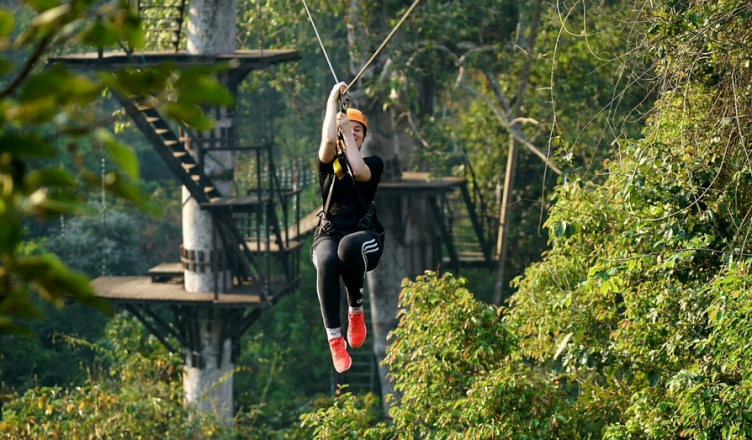 Zip lines and canopy tours are a fantastic way to quickly see a new area. You see everything from a different angle. Some canopy tours will even get you up close and personal with the local wildlife. Niagara Falls recently installed a zip line called the MistRider. This zip line has 4 parallel lines, so you and your friends can all zip at the same time. It’s great opportunity to turn your trip to Niagara Falls into an adventure tourism activity. Climbing is a classic example of an adventure tourism activity. It combines physical activity and allows you to take in the beauty of nature. Even if you’ve never climbed a day in your life, you can still get up a rock wall with the help of a guide. Make sure to check the safety record and accreditations of your rock climbing guide before heading out! Another option is to try climbing indoors. Many cities have rock climbing gyms so you can easily access some adventure! Ask if they have TRUBLUE Auto Belays so you can walk in and start climbing without needing an introductory class. When most people hear free fall they think bungee jumping or skydiving. While those are viable adventure tourism activities, they might not be for everyone. Head Rush Technologies engineered the next generation of free fall devices, the QUICKjump and the FlightLine, to provide an authentic feeling of free fall with less risk. You can find these devices in ropes courses, adventure parks and other facilities all over the world. There’s a good chance that there’s a Head Rush Free Fall Device location in close proximity to your next destination. Floating down a cool river on a hot summer day can be an excellent way to explore a new area. You get all the excitement of battling a rapid and you can also sit back and enjoy the view during the calmer sections of the river. The best season for rafting usually depends on the area you’re in and your desired level of adventure. 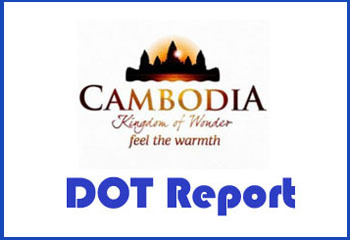 Generally speaking, the water levels are usually higher earlier in the season and lower later in the season. Higher water levels provide bigger rapids and more thrills, while lower levels are more subdued. If you’re talking about exciting physical activities that allow you to explore the outdoors, it would crime to leave out mountain biking. Mountain biking offers a great workout and a fun way to experience nature. You’ll be able to travel further distances on trails and see more of the surrounding area. New to mountain biking? No worries! Many locations have trails that range from beginner to advanced. If you’re near a ski resort, check to see if they have lift serviced trails. You’ll ride the ski lift to the top with your bike and then let gravity do most of the work as you cruise the green, blue, and black trails down. You might not have realized that your annual family ski trip qualifies as adventure tourism. Cruising down the slopes at a resort keeps you active and lets you experience the outdoors. The western United States is known for its exceptional skiing up and down the Rocky Mountains. You’ll find fresh powder and amazing slopes all the way from Alaska down to Utah, Colorado and even northern New Mexico. If you’re the adventurous type, you can abandon the resorts and set out into the backcountry. Backcountry skiing can be extremely dangerous if you aren’t properly trained. It’s absolutely necessary to take an avalanche safety class and buy all the proper safety equipment before you go off-piste. Consider hiring guide services for your first time trying backcountry skiing or snowboarding.